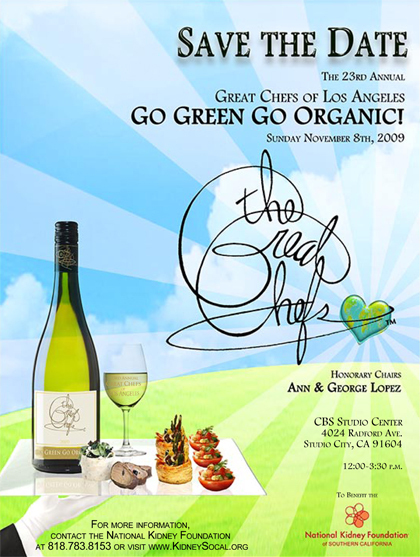 We interrupt this blog to bring you news of a cool event happening this Sunday, November 8 -- The 23rd Annual Great Chefs of Los Angeles! What's better than an afternoon of food, wine, and music? An afternoon of food, wine, and music that benefits the National Kidney Foundation of Southern California! This year's theme is eco-conscious living and sustainability. Go green! Go organic! In addition to all the delicious food prepared by these chefs, guests will receive reusable gift totes stuffed with $250 worth of green and eco-friendly goodies. Buy tickets directly from the National Kidney Foundation or get them for half price ($75) on Goldstar. Tasting Table, Urban Daddy, and GrubStreet LA also have special discount codes for 30% off tickets for their readers. Follow Great Chefs of LA on Twitter! There are deals and contests there, too! Wow - this sounds like a great event. I wish I had known about it before I made plans. M would have loved the green and organic component of it too. ditto D. We have plans already. Are you going Weezer? $250 of swag in the bag? tempting! but I dunno. It's a maybe baby. I'll be there! Love that Goldstar! This sounds far more fun than the plans I already have for Sunday. Celestino Drago is one of my favorite Chefs and a super nice man. I will be there! Sounds like fun! I wish I knew about it earlier though! I'm sad that I just saw this. I would have totally gone.